The evolution of digital technologies has fundamentally changed customers’ behavior and disrupted the way companies operate their businesses. It has broken down traditional barriers, creating new customer value chains and new business opportunities. Having the opportunity to be involved in some of the biggest deals in the world, we help corporates and private equity houses future-proof their business by building their digital capabilities and driving their inorganic growth. Using our sector knowledge and transaction experience, we look across different deal spectrums, whether they involve emerging technologies, products or services. We help companies to innovate and execute their inorganic growth strategies through their capital agenda. We help companies build their digital ecosystem and find the right target assets for them to partner with or to acquire. We advise and support them throughout the deal lifecycle to realize its full potential. How do I future-proof my business from digital disruption? 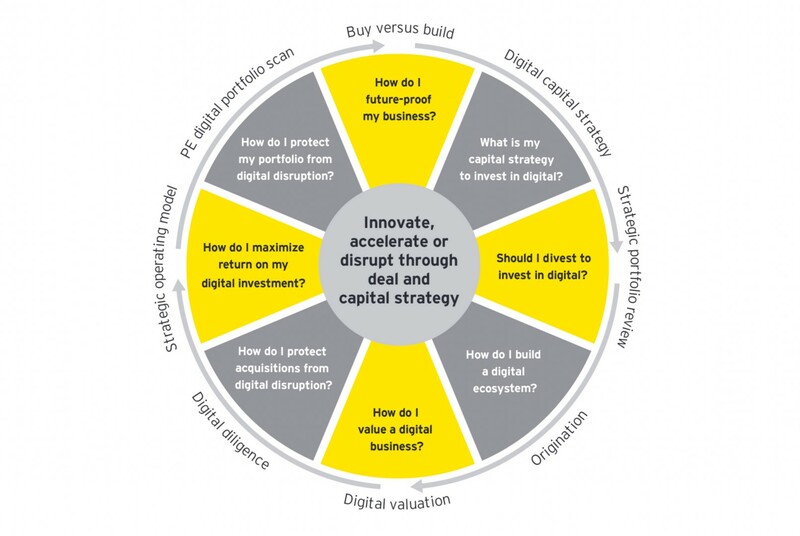 What is my capital strategy to invest in digital? Should I divest to invest in digital? How do I build a digital ecosystem? How do I best value a digital business? How do I protect acquisitions from digital disruption? How do I maximize return on my digital investment? How do I protect my portfolio from digital disruption?